We’re back from the greatest gathering of jedi, sith, smugglers, and bounty hunters the galaxy has ever seen – Star Wars Celebration Chicago! Kristen and Danny chat with Ana and bring their stories and “certain points of view” to relive the most exciting week of 2019 so far! Episode 121: Phantom Menace Pre-Celebration! This week, the crew (Danny, Ana, and Cheyenne) prepares for the long drive (or much shorter flight) to Star Wars Celebration Chicago! They discuss what they are looking forward to most and wishing upon the Force that the lottery goes their way! The crew also dive into what makes “The Phantom Menace” so special and why it certainly doesn’t get the credit it deserves! P.S. – We can’t wait to meet you all at Celebration! Not for the Jedi to end, not to enact Order 66, but to plan my second Star Wars Celebration; it’s already a doozy! 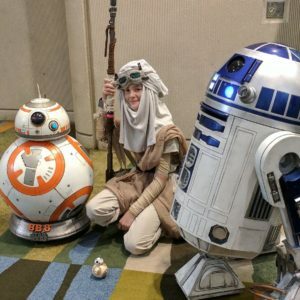 To provide some backstory, Star Wars Celebration (SWC) Orlando in 2017 was my first ever convention and SWC and it was a spontaneous night-before decision. My mom and I drove from Gainesville, FL to Orlando, FL around 5 A.M. to finally make it in line at 6 A.M. and were very lucky to snag Mark Hamill’s panel wristbands. It was a surprisingly smooth experience, however, I heard from lots of fans that SWC Orlando had not gone as smoothly as other Celebrations in the past. Without any prior knowledge I chose to shrug off this information. As a newly-minted SWC veteran, I am hoping my planning for this time around helps this experience go just as smoothly. What does one even do to prepare for crowds of hundreds of thousands of cosplayers and exhibitors and celebrities in a giant multi-floor convention center? The tickets were bought, the flights and hotel were booked, and the travel route and method from hotel to convention center has been mapped out…that was the easy stuff, what’s next? Waiting. That’s what came next. As an event planner, I understand the quality of releasing a full schedule instead of bits and pieces, so the time it took to upload the panel schedule, while excessive, was understandable. I stressed and stressed until the full panel schedule was released and the moment it dropped, I printed all 24 sheets. YIKES. When I figured out that that was not a compact, organized option, I created my own panel schedule based off of my interests. I attached the image below because I know a lot of people create theirs in Excel, I created mine in Word, so whatever keeps you from falling down a Sarlacc Pit of disorganization… use it. (P.S. excuse if any formatting didn’t transfer to this post). You’ll notice I still included things in the schedule that overlap; I did that for two reasons: 1) There needs to be time to get sidetracked, it’s one of the best things about being at any convention, 2) I’d rather have all my options written down, especially since there’s no guarantee that I’ll be getting into any of the lottery panels. In our post-Celebration pods/blogs we can shed some light on how the lotteries worked out so keep an eye out for that! Planning what to pack was one of the first thoughts I had after my tickets were bought; But I couldn’t do anything about that yet besides take stock of what I had and if there was any outfits I wanted to buy before Celebration. This is my first time cosplaying which also means my first time packing a cosplay. [I’ll be writing a piece on first-time cosplay after SWC so keep an eye out for that here on Kessel Run Weekly and my blog]. My cosplay is a simple Qi’ra so while there isn’t a lot to pack, nor is it bulky, I want to make sure I do everything right. Only being at SWC for two days allows for one day of cosplay + a change of clothes (because I plan like that) and one day of representing my favorite Star Wars things. I will not tell you what all of that is because I want it to be a surprise, but to see my Star Wars Celebration experience in real time — follow me on Instagram @cjerrica. Thanks for stopping by & May the Force Be With You! Join Kristen and Danny as they celebrate the Emperor of the Galaxy on this Palpatine’s Day! How well could Palpatine plan a date? Was Anakin just another trophy? Love him or love him not, they discuss all things Palpatine in this week’s episode of Kessel Run Weekly! Not so long ago, just last weekend actually, I had the privilege to journey to the galaxy far, far away and attend Star Wars Celebration Orlando 2017, for the first time. My anticipation for what felt like a once in a lifetime chance was high, very high. Growing up with Star Wars as a child and imagining myself as part of these worlds and these stories, meant the world to me. Like many of you, I cherished many life lessons I learned from the saga. Star Wars helped shape me in many ways. Learning that I would be able to be a part of Star Wars Celebration seemed unreal! Four days of Star Wars from sun up to sun down, completely immersed in the most wonderful fandom universe created, just never seemed enough. Every day held something new from my favorite universe. Dedicated fans stayed overnight and survived the “Reed Pop” Wars, braving unimaginable lines to attend their favorite panels and beating the odds to see their favorite actors and actresses. However, what I will take with me and remember most are my fellow Star Wars fans. Watching the 40th Anniversary Panel, The Last Jedi Panel, and even the Star Wars Rebels Panel with 300 or more fans that shared the same love and excitement as I did, was an incredible experience in and of itself. Seeing fellow fans cosplaying as their favorite Star Wars characters and bringing the greatest saga to life and the impact it made, even to a child, was incredible. Despite Reed Pop and Topps all but executing Order 66 themselves, nothing could have overshadowed or outshined the energy and electricity, the Force, that flowed through this spectacular Celebration. Although we don’t quite know when or where the next Star Wars Celebration will be held, we can look forward to the next time that we can all come together once again to celebrate the saga that has impacted us as fans for 40 years. Here’s to many more. May the force be with you!